DENVER, Co. — The Center for Medical Progress has released a fourth video expose’ on the abortion giant Planned Parenthood, this time showing a local official discussing ways that the organization has sought to avoid trouble with the law and outlining the “specimen” collection process following abortions. She says that her attorney, Kevin Paul, has helped Planned Parenthood of the Rocky Mountains learn how to handle the situation. 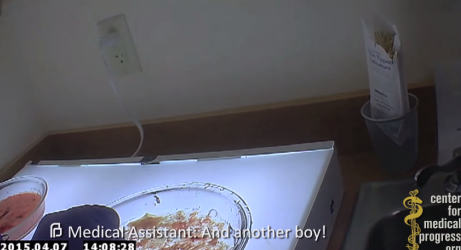 In another segment of the video, undercover investigators are allowed to witness the dead “specimens” following an abortion. “It’s a baby,” Ginde tells them. “And another boy!” an assistant exclaims after looking for where the legs of the child had been. “Five stars,” she says moments later, finding an intact heart in the specimen dish. “[T]his coordinated attack on women’s health will not deter us from providing essential reproductive health care and from advancing important medical research,” she said. The national headquarters likewise brushed off the footage, stating that using the bodies of aborted babies for scientific purposes provides a means of comfort for the mothers of the dead. “The opportunity to donate fetal tissue has been a source of comfort for many women who have chosen to donate. We will continue to prioritize the health and safety of our patients, and advocate for removing barriers to essential health care,” said Planned Parenthood Executive Vice President Dawn Laguens. But the Center for Medical Progress said that Planned Parenthood is trying to avoid having to face accountability for its actions. “Elected officials need to listen to the public outcry for an immediate moratorium on Planned Parenthood’s taxpayer funding while the 10 state investigations and 3 Congressional committees determine the full extent of Planned Parenthood’s sale of baby parts,” director David Daleiden said in a statement.